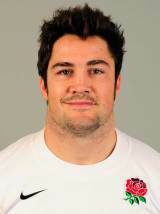 South African-born Brad Barritt is a powerful centre who adds a physical presence to both Saracens and England's back line. He emerged as a rugby talent with Natal and the Sharks in Durban where he made his debut in 2006 before going on to share in his side's Super 14 Final loss to the Bulls in 2007 and their Currie Cup triumph in 2008. He also featured for the Emerging Springboks and helped them claim the IRB Nations Cup title in 2007. A powerful centre, he opted for a switch to Saracens in 2008 and a series of impressive performances in the Premiership, and an English passport, brought him to the attention of England manager Martin Johnson. He was drafted into the England Saxons squad in 2009 and scored a try on his first appearance for the side against the United States in that year's Churchill Cup. He retained his place in the England elite squad the following season and featured for the Saxons against Ireland 'A' and Italy 'A' and also helped Saracens reach their first ever Premiership Final. He returned to the Churchill Cup stage again that year but earned a late call-up to the England squad touring Australia and New Zealand where he made his first senior bow in the non-Test clash against New Zealand Maori. Barritt shone throughout the title-winning season of 2010-11 for Sarries but failed to make a dent in the England pecking order. The arrival of a new England coaching set-up post-World Cup brought a change of fortune with his Test debut finally coming against Scotland in the 2012 Six Nations and he would go on to be a key figure in the Stuart Lancaster era. Injury limited his contribution to the 2012 tour of South Africa but he regained his place in the England midfield for the end of year internationals and claimed a try in the victory over New Zealand. He was an ever-present throughout the 2013 Six Nations and although he missed out on the original British & Irish Lions squad, he was later called up as injury cover.